Neither 2011’s Insidious nor 2013’s Insidious: Chapter 2 made a ton of money at the box office. However, they came with such small budgets that they earned nice profits – good enough to spawn another sequel, 2015’s Insidious: Chapter 3. While the first two movies concentrated on modern-day events related to the Lambert family, Chapter 3 brings us a prequel. Set “a few years before the Lambert haunting”, young Quinn Brenner (Stefanie Scott) seeks out psychic Elise Rainer (Lin Shaye) to attempt to contact Quinn’s recently deceased mother Lilith (Ele Keats). Elise doesn’t like this idea but she reluctantly agrees to assist the teenager. This doesn’t go well from Elise’s point of view, though, as disturbing images remind her why she left the psychic business. Undeterred, Quinn continues to attempt to reach her mother, an endeavor that comes with unintended consequences, as Quinn opens the door to unwanted spirits. Neither of the first Insidious films did a lot for me, but I kept hope alive that Chapter 3 would become a more compelling film. With a new director and a mostly new cast, I figured that the third time might be the charm. Chapter 3 does carry over one major participant: writer Leigh Whannell. He penned the first two films and also makes his directorial debut with Chapter 3. The fact Whannell composed all three scripts tempered expectations that the third movie will present a substantially different experience, however. To my surprise, Chapter 3 does manage to create a vibe all its own, though I can’t claim this makes it wholly original. Nonetheless, it feels fresher than its siblings. 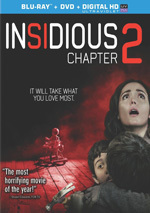 Actually, the first half of the first Insidious worked fairly well, but it fell apart in its second segment, and Chapter 2 suffered from similar issues. Like the original movie, Chapter 2 started in a satisfying manner but it went off the rails as it progressed. For the most part, that doesn’t occur here. Like the first two films, I think the first half of Chapter 3 works best, but unlike its predecessors, the third movie manages to remain pretty good from beginning to end. 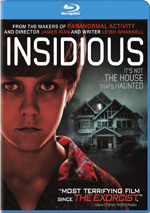 Of the first two flicks, I preferred Insidious, but I disliked its derivative nature. That one felt like a mash-up of Paranormal Activity and Poltergeist, so it never managed to develop an identity of its own. While I can’t call Chapter 3 a wholly original experience, at least it doesn’t wear its influences so obviously on its sleeve. It also manages a quieter, creepier take on the genre. The first two movies tended toward more overt stabs at scares, with the ubiquitous “boo!” moments at the fore. Chapter 3 comes with some of those jolt elements, but it favors a more general sense of spookiness. This benefits the film, as it leaves the viewer on edge. Quick, cheap fright moments don’t provide real emotion; they prompt adrenaline and little else. A darker sensibility makes for more effective horror, and that becomes the case here, as the film manages to leave us anxious and unnerved much of the time. It helps that it focuses more heavily on the Elise character. Shaye has long been relegated to supporting roles, so it’s nice to see her get a bit more time in the spotlight. She manages to bring heart and emotion to Elise, and that adds to the story’s impact. All of this adds up to a fairly effective little horror experience. Insidious: Chapter 3 doesn’t stand as a great movie but it achieves its goals and leaves us with a surprisingly creepy film. Insidious: Chapter 3 appears in an aspect ratio of approximately 2.39:1 on this Blu-Ray Disc. This became a strong visual presentation. At all times, sharpness seemed very good. Any instances of softness remained negligible, as the film appeared accurate and concise. Jagged edges and moiré effects didn’t mar the presentation, and I saw no edge haloes. Print flaws also failed to appear. Should one expect a standard teal and orange palette here? Yes, one should, though the orange tended toward amber much of the time. Within stylistic choices, the hues seemed well-depicted. Blacks were dark and dense, and low-light shots gave us good clarity. I felt pleased with this impressive transfer. In terms of extras, we get a collection of five featurettes. With a total running time of 54 minutes, 29 seconds, we find “Origin Story: Making Chapter 3” (19:04), “Stunts: The Car Crash” (9:35), “Macabre Creations” (8:58), “Cherry Glazerr: Tiptoe Through the Tulips” (5:16) and “Being Haunted: A Psychic Medium Speaks” (11:34). Across these, we hear from writer/director/actor Leigh Whannell, producer Jason Blum, producers Oren Peli and James Wan, stunt coordinator Mark Raynor, Fractured FX CEO Justin Raleign, musicians Clem Greevy, Sean Redman and Hannah Uribe, psychic medium Michael J. Kouri, and actors Stefanie Scott, Dermot Mulroney, Lin Shaye, Angus Sampson, Steve Coulter, Ashton Moio, Hayley Kiyoko, and Michael Reid Mackay. The featurettes examine story/character areas, cast and performances, Whannell’s impact on the production, stunts, makeup and effects, music, and aspects of psychic phenomenon. The first three programs work best, as they give us good info about the movie’s creation. “Glazerr” offers a fluffy discussion of that band’s cover of “Tiptoe Through the Tulips”, while “Speaks” gives Kouri more credibility than he deserves. Three Deleted Scenes run a total of five minutes, 16 seconds. We locate “Quinn Finds Pictures” (1:32), “Hospital Aftermath” (2:37) and “Specs Explains His Job” (1:07). All of these offer some basic exposition. None of them seem necessary or add much. The disc opens with ads for The Final Girls, Air, Risen, Extinction, Broken Horses and Lake Placid Vs. Anaconda. No trailer for Insidious: Chapter 3 appears here. After two erratic films, I didn’t expect much from Insidious: Chapter 3. To my pleasant surprise, the film offers a creepy, effective horror tale that gives us the unnerving experience we want. The Blu-ray delivers excellent visuals along with good audio and a decent set of bonus materials. Chapter 3 becomes the best of the Insidious franchise.